The original Left 4 Dead was released only one year ago, but its sequel is already out and in the hands of millions. 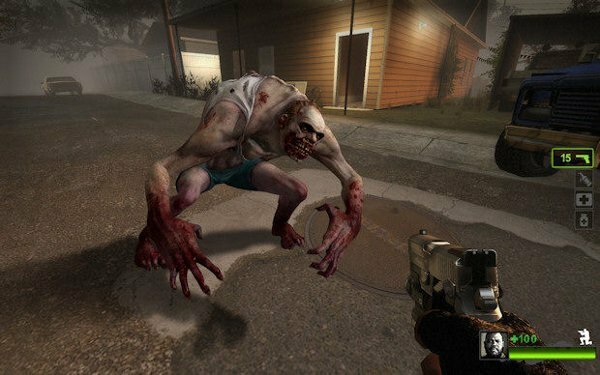 With such a short development cycle, many seemed to doubt that Left 4 Dead 2 could possibly be worth its full $60 retail price tag. That's a matter of opinion, but I disagree with that notion. 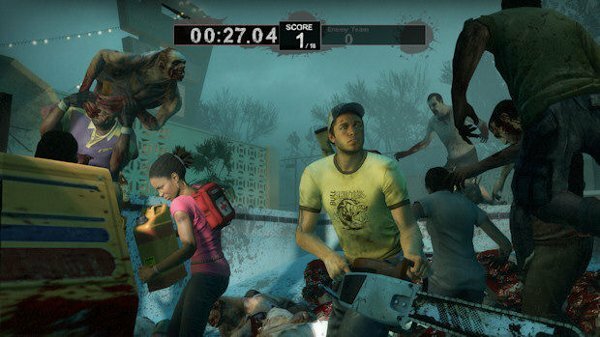 With L4D2, Valve aimed to take what they had created in the original game and simply add more. More guns, more secondary weapons, more handheld explosives, more campaigns, more modes, more characters, and more pretty textures to enhance the visuals have all been added for this go-round in the Left 4 Dead universe, and it's all for the better. Aside from the five new campaigns, the core gameplay of Left 4 Dead has been changed by the addition of many new weapons. There are 10 new melee weapons - the baseball bat, cricket bat, crowbar, guitar, axe, frying pan, katana, machete, police baton, and (hold it) chainsaw - all of which replace the pistol in a player's inventory and can be used to take out numerous enemies at close range. The number of conventional firearms has been upped as well with the addition of a grenade launcher, magnum pistol, and several variations on the basic shotguns, assault rifles, uzis, and sniper rifles that are so conveniently left scattered about throughout the game's environments. There are also new items to help you out. Players can now find jars of Boomer bile (which goes in the inventory slot for the pipe bomb or molotov) which they can throw onto unsuspecting enemies (preferably a tank) to get the zombie horde to rush and attack their fellow undead. A defibrilator, which can be used to revive "dead" teammates, has been added as a replacement for the basic med kit. This can come in handy in some certain situations, but in my experience it was almost always better to simply have a medkit so death could be avoided altogether. Finally, the addition of adrenaline shots makes your character move at super-fast speeds with the ability to perform normal tasks (like healing another survivor) much more quickly than one normally could. Three new special infected types make their debut in Left 4 Dead 2, and all of them bring something fresh to the table. The Jockey is a creepy little primate-type creature that can mount and ride survivors to their doom, all the while doing small chunks of damage to them. The Charger is almost like a miniature tank, although he differentiates himself with his charge attack, which lets him football-tackle survivors and sprint with them until running into a solid object, whereapon he takes it upon himself to try to repeatedly insert the limp human body he has captured into the core of the earth. The Spitter is the most grotesque of the new special infected, and she vomits pools of acid that deals high rates of damage to the survivors unlucky enough to find themselves swimming in her upchuck. Each of the new special infected adds some much-needed variety to the Versus mode, in which players can play as the special infected against other survivors (or vice-versa). There are four new survivor characters in Left 4 Dead 2, and I might sound like a grumpy old man, but they're just not as good as the old characters. I repeatedly found myself calling Rochelle "Zoey" in multiplayer sessions due to her complete lack of a personality to separate herself, and while Nick is a really cool character, the blandness and generic personality of Coach turns the quality of the new squad to "low." Ellis (the redneck) is pretty funny, but as a resident of southern Mississippi I find myself annoyed by his antics more often than not, as he reminds me of numerous people that I actually know. Besides the new daytime areas, each campaign in Left 4 Dead 2 feels much more special and unique than the campaigns from the original game, where everything got a bit repetitive. Each campaign features an "uncommon" common infected: a special type of basic infected zombie that has a special property. In The Parish, the final campaign on the disk, the featured uncommon infected are S.W.A.T. squad members, complete with bulletproof vests that make them much more difficult to take down. I won't spoil the details of the uncommon infected from the other campaigns, but I'll gladly talk about the new variety in what can only be described as "mini-missions" throughout each campaign. Instead of having each level contain an area that players must bunker down in and defend for a set amount of time (like in the first game), players in Left 4 Dead 2 are handed unique objectives at certain gameplay intervals. One area has the survivors escaping a burning building, while another has them retrieving a pack of Coca-Cola for a gunshop owner so in exchange for the detonation of a certain tanker that would have otherwise blocked the path of the motley group. One level has players finding gas tanks scattered around a mall in order to fill up the gas tank of a car (which, of course, leads to the survivors' temporary escape from danger and the end of that particular campaign). The latter example of a sub-mission within the campaigns serves as an introduction to one of the new modes, "Scavenger." Aside from the modes from the original game (Survival, Campaign, and Versus) two new modes, Realism and Scavenge, have been introduced in Left 4 Dead 2. Realism functions more as a difficulty modifier than a truly new mode, as it turns off all colored outlines around items and characters. This doesn't seem like a big deal at first, but it really forces players to communicate since seeing each other through walls in this mode is not possible. Scavenger mode is the new star of the show, and it works a lot like the aforementioned campaign sequence in which the survivors collect gas tanks. In Scavenge, two teams switch between playing as the infected or the humans (much like in Versus) and attempt to get more gas tanks than the other team, all while being bombarded by Spitter goo, Jockey attacks, long-range Smoker snares, and Boomer puke that sprays in the air like a green by-product of a water-ride at Disney World. What I at first assumed to be a small addition to the package turned out to be one of the best parts of this sequel, and I'll probably be playing the mode for a long time to come. 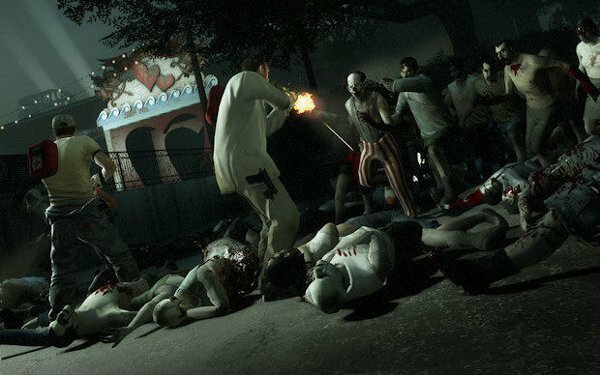 Left 4 Dead 2 doesn't have that "new game smell" that the original did upon its release, but it stands head and shoulders above its predecessor as an all-around superior product because of its vastly broader scope of usable items, weapons, enemies, levels, modes, and mission variation. A quick run through all the campaigns will only take about five hours, but the meat of this package lies in the multiplayer modes, all of which are better than ever. Fans of the first game would be missing out if they didn't give L4D2 a spin, and newcomers have picked a great time to get into the series. This is a perfect example of how to do a video game sequel the right way.